Hello and welcome! No no, we don’t need to see your passport. If you’ve wandered here through cyberspace, the chances are that you mis-typed something on Google. Because of course there is no such word as Veggiestan. And indeed no such place. 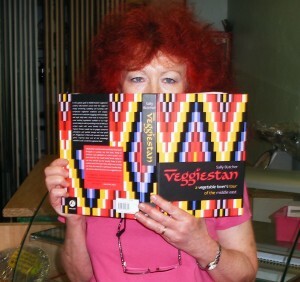 Veggiestan is the title of a new book. This book. 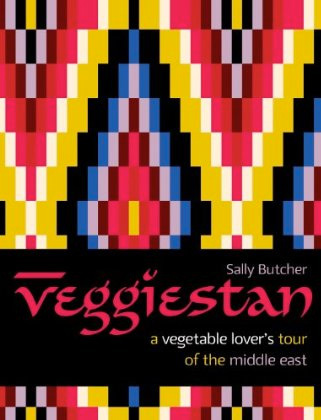 It came out in October 2011, and is, as you might have guessed, a vegetarian, Middle Eastern recipe book. With rather a lot of add-ons. It got so big and unwieldy that the publishers made us chop bits out. So we thought rather than waste all the out-takes, we’d share them with you. Together with lots of other stuff, vegetarian, Middle Eastern and otherwise. So come on in. Enjoy your stay. Sign the visitors’ book if you like. Tell your friends. Oh, and most importantly…buy the book. Veggiestan is the creation of Sally Butcher, who is an accident prone and accidental shopkeeper. The keeper of this shop, to be precise. Before that she was an accident prone and accidental chef. She lives mostly in Peckham with her Persian husband, Jamshid, who runs the wholesale side of the business, and Chombol, her non-Persian cat, who does nothing. You can read other Sally-shaped stuff in her first book, Persia in Peckham, or by checking out her very silly cornershop blog. She also writes for Londonist, which is quite simply the best Londony blog ever.